I have an etiquette request: Please remember to introduce yourself by name after someone has introduced himself or herself to you. This may seem like a little thing, but it’s important. Let me explain. Before most of my seminars begin, I shake hands with each participant and say, “Hi, I’m Barbara Pachter, your instructor. Welcome, and enjoy the day.” Many people respond appropriately and will introduce themselves, also. This kind of etiquette give-and-take paves the way for a connection between the two people, and makes it easier for conversation to begin. When people don’t volunteer their names without prompting, they appear shy, timid or standoffish. As a result, making a connection or starting a conversation can be more difficult. It’s not just in my seminars that people fail to give their names. People tell me the same thing happens to them when they attend meetings and introduce themselves to the men or women sitting next to them. In my classes, I know that some people are startled when I introduce myself to them. They are not expecting the instructor to practice this protocol. One woman sent me a thank-you note, emphasizing how much she enjoyed meeting me before the seminar started. She hadn’t experienced this with other instructors. Other people may not give their names because they are preoccupied, or because they simply don’t know they should do so. Monitor your own behavior. Pay attention when people introduce themselves, and please respond with your full name. You may be surprised at what a positive difference it makes in your interactions with others. 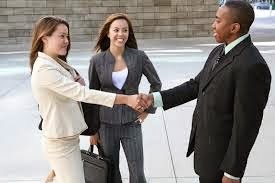 Additional information on greetings, introductions and conversation can be found in The Essentials of Business Etiquette: How to Greet, Eat, and Tweet Your Way to Success. Pachter & Associates provides training and coaching on business etiquette and communication skills. For additional information, please contact Joyce Hoff at 856.751.6141 or joyce@pachter.com. Thanks for sharing such valuable information. If anyone wants to cheap flights to Delhi from Boston in unbeatable price then call our travel experts. The insurance solicitation letter is provided there. It can help you in the solicitation letter. There is number of tips of writing letter.